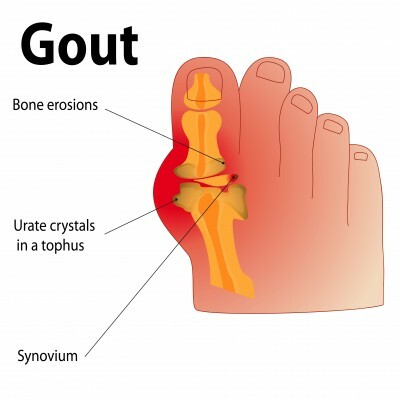 Gout is a condition where there is an accumulation of urate crystals in and around joints. The sudden and intense episodes of gout are characterized by pain, redness, warmth, and swelling in the joints. A majority of the patients experience the symptoms in the joint of the big toe. Gout is a form of arthritis – joint inflammation. The syndrome of deposition of urate crystals in the joint is known as gout, and the irritation of the joints by these crystals are more correctly referred to as gouty arthritis. Gout mostly affects women after menopause and middle-aged men. It often resolves completely and recurs again every now and then. This may continue right until the senior years. Severe joint pain with intense pain in the large joint of the big toe, or joints of feet, knees, ankles, wrists, and hands, for 12 to 24 hours or more. Discomfort in movements. Lingering joint discomfort is reported for a few days to weeks. Recurring attacks are last longer and involve more joints. Inflammation. The affected joint or joints become inflamed and swollen, warm, and red. Natural substances called purines are found in all cells of the body, and in a majority of foods. The metabolic breakdown of purines produces uric acid. Normally, uric acid is passed through the kidneys into the urine, but over-production of uric acid in the body or impaired excretion of uric acid by the kidneys can result in high levels of uric acid. Uric acid accumulates in the joints or surrounding tissues in the form of urate crystals. These needle-shaped, sharp urate crystals cause inflammation, pain, and swelling of the affected joint. A similar condition can occur with another compound known as calcium pyrophosphate. It causes a condition known as pseudogout. A blood test reveals the levels of uric acid in the body. For further diagnosis, the fluid from the affected joint is checked for the presence of urate crystals. Treatment of gout aims at managing acute attacks and preventing future attacks with both medication and lifestyle changes. The purpose of long term management is to reduce the risk of complications from gout. The use of non-steroidal anti-inflammatory drugs (NSAIDs) (like ibuprofen, naproxen, and indomethacin) efficiently manages inflammation and pain. NSAIDs are usually well-tolerated but may have side-effects like stomach pain, bleeding, and ulcers in some patients. Injection or oral administration of corticosteroids (like prednisone) is recommended to some patients to control inflammation and pain. The side effects may include thinning of the bones, impaired wound healing and impairment of immune system. A pain reliever colchicine is recommended to some patients. The drug has side effects like diarrhea, nausea, and vomiting. Daily use of colchicine and an NSAID prevents recurrent acute attacks. Drugs called xanthine oxidase inhibitors (like allopurinol and febuxostat) reduce the production of uric acid in the body. Allopurinol side effects include rash and low blood counts. Febuxostat use is associated with side effects like rash, nausea, and impaired liver function. Medications called uricosuric drugs, like acetazolamide, probencid and losartan, improve uric acid removal by kidneys. Side effects of probenecid use are stomach pain, rash, and kidney stones. Increased fluid intake is recommended for all gout patients.